Gang Green hopes they’ve drafted a signal-caller who, at long last, can get them to the Super Bowl. FLORHAM PARK, N.J. —The Jets selected USC quarterback Sam Darnold with the No. 3 overall pick in Thursday night’s NFL Draft, and their long-suffering fans hope they got their savior. 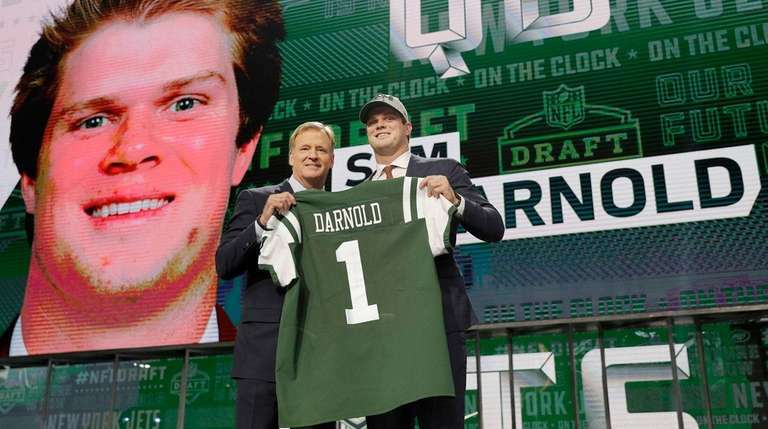 Darnold becomes the seventh quarterback drafted in the first round in franchise history. Of course, only one — Joe Namath — has led the team to a Super Bowl. Darnold said he welcomes the challenge of becoming the franchise quarterback the Jets have been looking for since Namath’s departure more than 40 years ago. Darnold was projected as the top available quarterback when this process started, but during the 24 hours before the draft began, the Browns, who had the No. 1 pick, started leaning toward Oklahoma quarterback Baker Mayfield. Even after Mayfield was selected by the Browns, the Giants could have messed things up for the Jets at No. 2. But when they drafted Penn State running back Saquon Barkley, the Jets and general manager Mike Maccagnan got their shot at Darnold. The Jets ended the 2017 season with the sixth overall pick, but on March 17, they traded three second-round picks — two in 2018 and one next year — to the Colts to move to No. 3 overall. Maccagnan said there were three players he felt good about grabbing at the No. 3 spot, and while he wouldn’t reveal who the top quarterback on his board was, there were positive vibes about Darnold. In two seasons at USC, Darnold completed 64.9 percent of his passes, throwing for 7,229 yards, 57 touchdowns and 22 interceptions. In his redshirt freshman season, Darnold threw 31 touchdown passes and only nine interceptions. But he struggled with turnovers last season, committing 22, which alarmed scouts. Darnold worked with former NFL quarterback Jordan Palmer on the problem. He said that when he was in the pocket, he would hold the ball with just his right hand. He said he’s been working on keeping his left hand on the ball to secure it better. Darnold most likely won’t be the Week 1 starter unless he beats out Josh McCown or Teddy Bridgewater. Bowles has final say on who plays, and last season he kept Bryce Petty as the starter over Christian Hackenberg at quarterback after McCown was injured. Bowles’ philosophy: You earn playing time, and if you outperform the man in front of you, then you play. Darnold already has a fan in USC alum and former Jets No. 1 pick Keyshawn Johnson.